Those of us who are restoring or modifying our classic muscle car—especially the mid-60’s Mustangs and Camaros – will typically have purchased the factory service manuals, assembly manuals and a host of “how to” and restoration books. But often times, a video of the particular task we are attempting will go a long way in helping make sense of the process. Unfortunately, the internet (YouTube in particular) is filled with videos that are not only amateurish but misleading or in some cases downright dangerous. Many manufacturers have sites where they show the installation of their products, while these are helpful, they usually are made in a fully equipped work space, with a lift and very clean cars/components. What the typical garage based home restorer needs are professionally produced videos that detail not only the subject, but show it in “real life” with jack stands and dirty/rusty parts and pieces. Such a site is AutoRestoMod.com. AutoRestoMod.com is the creation of Jeff Ford and his friend Vince Witters. Jeff is a lifelong Ford guy and a former editor of Mustang Monthly and Legendary Fords. Seven years ago, Jeff and Vince were dismayed at the awful stuff they saw on you tube and decided to try their hand at producing their own. After realizing that a hand held video camera would not produce the quality of video they wanted, they “took the plunge” and purchased a Prosumer HF200, then two more. They were gifted two lapel mics by a good friend - Micah Nehring- and bought a jib crane for $99 and spent $200 to make it work. To say that they hit a steep learning curve is an understatement. But they prevailed, and since their first episode on their YouTube channel (https://www.youtube.com/autorestomod) on July 8, 2010, they have produced over 340 videos. Their goal was simple – “we are here to help the enthusiast with our learning curves and experience”. 1. If we can do this we KNOW you can. 2. It's not a problem it's a project. 3. We read the instructions so you don't have to. Their videos cover virtually every aspect of the process of mechanically restoring a car including paint and body work, interior and electrical. I can personally attest to their value. My Mustang restoration included replacing the front aprons and radiator support which I had never done on any car. Their videos walked me through it and it came out fine. Same for the installation of a Borgeson™ power steering unit to replace the stock Ford set-up. Even a conversion to front disc brakes was made easier by watching their videos. 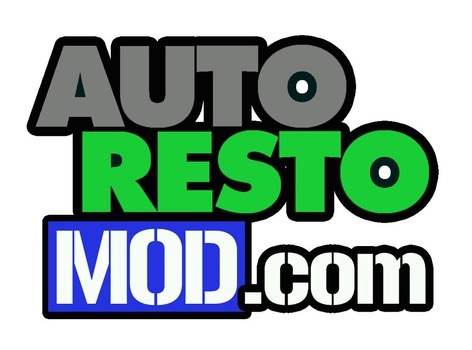 AutoRestoMod.com currently has hundreds of videos covering Fords and GM products. When asked “Why no Mopars ?”, Jeff said, “We know that at some point we will get into them, but for now no one has stepped up to bring us one. We'd LOVE to do a Challenger or Charger or Road Runner.” With Jeff and his small but dedicated crew adding stuff every week to their show, I wanted to know if there was anything new in the works. Jeff told me that they are about to fully launch Manic Mechanic. This show will be a good place for those things that they do that don't quite fit into AutoRestoMod. The show will air on Mondays or Tuesdays on the AutoRestoMod channel. They also have AutoRestoMod tech tips https://www.youtube.com/channel/UCRHn-WzdeMPvscmhDVbot4g, this was an offspring of the small videos they do on Facebook each week that give out handy little tips for the car, garage, or owner. We at No Limits (and the Editor personally) want to thank Jeff for his efforts. If you are restoring your muscle car (or any car for that matter) and want to see professionally done instructional videos that are practical in nature – they even show their mistakes (so you don’t do them) as well as the hard to remove /rusted out/ get a big hammer efforts required when working on 40 -50 year old cars then AutoRestoMod.com is for you. We wish Jeff and his crew continued success and have to believe that Velocity or MavTV or one of the cable networks will spot this talented and personable series and bring it to a wider audience.